It is advisable to look from the tide pool to the stars and then back to the tide pool again. 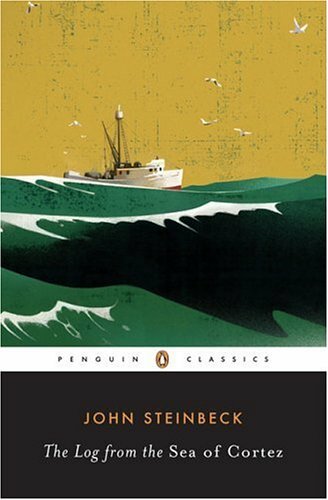 John Steinbeck and Ed Ricketts set sail from Monterey Bay on March 11, 1940 on a six week specimen collecting trip around the Baja Californian peninsula and the Sea of Cortez. This journey was documented in the collaborative publication entitled Sea of Cortez: A Leisurely Journal of Travel and Research. The narrative portion of this text (shorn of Rickett’s exhaustive specimen list) was later published under the name The Log from the Sea of Cortez. This journey, as well as resulting in a fascinating piece of travel literature, proved to be the catalyst for the rest of Steinbeck’s Mexican works. Throughout the narrative, Steinbeck juxtaposes philosophical musings against his documentation of the long days of specimen hunting in the littoral regions of the peninsula and the origins of his later Mexican projects are found within the pages of his Log. Steinbeck produced a small but significant number of Mexican- based works in a variety of media. By Mexican works, I mean The Forgotten Village (‘docudrama’ and ‘pen-camera narrative’, 1941) the The Pearl (the novella and the film, both produced in 1947), and Viva Zapata! (in its various manifestations as a ‘narrative in dramatic form’, screenplay and, finally, film production, 1952). Much of the ideas behind these later works began their gestation among the turbellarian worms, gastropods and anenomes of the Baja Californian rock-pools and the ramshackle bars of coastal villages. The Indians who sat on the rail of the Western Flyer had a different time sense – “time-world” would be the better term – from ours. And we think we can never get into them unless we can invade that time-world, for this expanding time seems to trail an expanding universe, or perhaps to lead it. Humans are not much wanted on the Peninsula. But at La Paz the pearl oysters drew men from all over the world. And, as in all concentrations of natural wealth, the terrors of greed were let loose on the city again and again. An event which happened at La Paz in recent years is typical of such places. An Indian boy by accident found a pearl of great size, an unbelievable pearl. And the rest is history… Steinbeck would later tell the great Emilio ‘El indio’ Fernández the pearl anecdote and he then, encouraged by Fernández, wrote the novella knowing that a film would be forthcoming. Both were released in 1947. The film was shot with a Mexican cast in two languages, Spanish and English. Boasting delightful cinematography by the legendary Gabriel Figueroa, the Spanish-language version was nominated for a host of prizes at home - winning Arieles for Best Actor, Best Director and Best Cinematography and abroad - winning the Golden Lion at Venice in 1947 and a Golden Globe for Cinematography in 1949. How could one make an Indian understand the medicine which labors to save a syphilitic, and the gas and bomb to kill him when he is well, the armies which build health so that death will be more active and violent. It is quite possible that to an ignorant Indian these might not be evidence of a great civilisation, but rather of inconceivable nonsense. Our curandera was a real ‘wise woman’, one who practiced herbology and magic in the village; our teacher was a real teacher in the government school; our doctors real doctors; our mother a real mother who had lost a number of children. The film centres around a child named Juan Diego who, concerned by the epidemic of child deaths in his village, defies his family and townsfolk by seeking the help of modern doctors and inoculation. As none of the villagers could speak English (and some of them spoke little or no Spanish), the story is told by a narrator. In this way, Steinbeck’s script functions as a voiceover performed by Meredith Burgess. While the film garnered praise in later years and was presented in restored format at the UCLA Festival of Preservation 2011, its impact in 1941 was lessened due to the attack on Pearl Harbour just weeks after the film’s release. The film also appeared in print form. The Forgotten Village: Life in a Mexican Village was published by Viking Press in 1941. The format was unusual. From the 8000 feet of footage, 136 photographs were chosen to illustrate Steinbeck’s script and each photograph was presented with the corresponding text below it. In this way, the book presents itself as a picture-book and the juxtaposition of the simple, sparse text with illustrative photographs makes this book accessible to readers of all ages. Much can be written about Steinbeck’s complicated and drawn-out Zapata project. Its connection to the Log is slightly more indirect than the other works discussed here. In fact, its gestation began years before the Sea of Cortez voyage. The author made many trips to Mexico throughout the thirties and conducted a huge amount of invaluable oral history research speaking to participants in the Revolution and contemporaries and acquaintances of Zapata. However, while Steinbeck spent around twenty years researching his screenplay for the 1952 film (for which he was nominated for an Academy Award for best story and screenplay), his experiences on his voyage around the Sea of Cortez were of vital importance. It was his aforementioned fascination with the tension between traditional and modern medicine that he experienced up close during this trip that led him to formulate a vital character in his original Zapata narrative– the curandera. In Mexico there are still very few doctors. In the early twentieth century, in the hill districts, there were none at all, except in the large towns, and they were half-trained quacks. The curandera does all of the village healing. She does it with herbs, and she does it with magic, and some of the magic is very, very old. These women have great authority. They are a combination of psychoanalyst, hypnotist, magician; they are the mid-wives. In some parts of the country their practices for forcing birth are so savage that deaths in childbirth increase. While the importance of the curandera was excised from the later screenplay for Viva Zapata! her prominent role in Steinbeck’s original ideas for the script (which may have resulted in a more satisfying film had they been included in Viva Zapata!) again highlight the influence of Steinbeck’s observations about the ‘Indian’s’ painful entrance to the 20th Century – a topic that permeates his Log from the Sea of Cortez. This article does not pretend to be an exhaustive record of Steinbeck’s many trips to Mexico. For that purpose a much larger investigation must take place. There are parallels between his observations on the plight of poor Mexican peasants and the struggles of the characters in his canonical works of fiction (The Grapes of Wrath, East of Eden, Of Mice and Men etc). For this reason, there is ample room for further investigation. However, that falls outside the scope of this small article. It is hoped that this text will provide impetus for readers to seek out The Pearl, The Forgotten Village, Zapata and, in particular, The Log from the Sea of Cortez. If this does indeed occur, readers will note how Steinbeck, in both the tidal ripples of the warm water and in conversations with local fishermen, found copious amounts of material for his later work. The reader will also note, occasional hackneyed visions of indigenous people notwithstanding, Steinbeck’s deep love for and fascination with, all things Mexican. The Log from the Sea of Cortez, p. 179. The Log from the Sea of Cortez, p. 72. The Log from the Sea of Cortez, p. 85. The Log from the Sea of Cortez, p. 172. The Forgotten Village: Life in a Mexican Village, pp. 5-6.